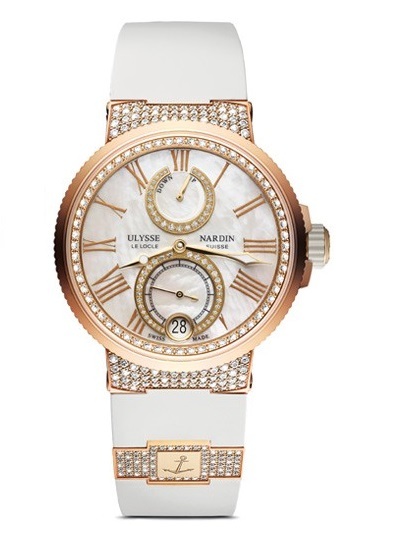 Ulysse Nardin Lady Chronometer with diamonds. Absolutely Beautiful, Gorgeous & Elegant! 39mm, polished rose gold case, in house automatic movement, with a 48 hour power reserve indicator, and date. White Mother of Pearl dial, diamond case and bezel. It also features a glass exhibition case back with the visible rose gold rotor etched with the Ulysse Nardin and anchor logo. Available on a sporty and elegant white rubber strap with rose gold folding buckle.